Professional Skyscraper High-Rise Window Cleaning at its Best! No risk, no scratches and high efficiency! Call now ‎(206) 790 6552! Not only that we provide top quality services, we take care of the environment, too. We use pure water, so the customers can get risk-free and green cleaning services. Our technicians are insured against any mishaps and all of them have gone trough a comprehensive training to provide safe cleaning services using the most advanced and safe machines available today. Call us at any time of the day, explain us your problem, and we will come to make an inspection and advice you how to deal with that issue. We work all days of the week, so we are always available to help. How the window cleaning is performed? The company knows how important it is for the commercial buildings to keep the windows professionally clean and intact. That is why, they use the most advanced gear for this purpose. We perform the cleaning with the self-climbing HighRise™ window cleaning system, which leaves no scratches and not only thoroughly cleans the frames and windows, but also the entire building to extend iims life. Our company has chosen this self-contained machine due to a number of benefits it provides to the customers. After all, this is the most important thing we pursue. The work is starting from the top of the building and saves months of window cleaning work allowing us to perform all the necessary cleaning tasks in a single day. Our technicians are experienced in its remote control operation. This helps customers save a lot of money too and have perfectly cleaned windows. Moreover, the windows cleaned by Skyscraper Window Cleaning with HighRise™ machine /the only one in Seattle WA/ stay cleaner much longer compared to those that are cleaned by hand. Skyscraper Window Cleaning never uses chemicals in the process of high-rise cleaning knowing that they might damage the windows. We use only pure water. Call ‎206 790 6552 for FREE Estimate! Glass Restoration (Deposit and Stain Removal) – We are experienced in the art of window cleaning. If people have a chance to look at the glass under a microscope, they will find out that its surface is not as smooth as they suppose and there are potholes and peaks on the surface. Rains contain inorganic or organic contaminants that react with the glass as soon as they get into these holes. This makes the window to look discolored and stained. While the glass is new, these stains are unnoticeable but as the time passes, the deposits are built up and start a process of glass corrosion. We are experienced in removal of all types of window stains that include chemical damage from acid rains, glass oxidation, hard water stains, etc. Scratch Removal – People do not need to replace their windows because of the scratches. We utilize the latest technology to provide effective scratch removal and glass polishing. Our customers can now take advantage of this greener, affordable, simple, and timely alternative to window replacement. 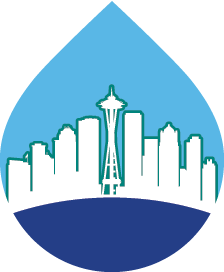 Miscellaneous Building Envelope Maintenance – Our company provides extensive maintenance services to the large commercial buildings in Seattle and Bellevue area. They include roof repairs, cleaning, brick sealing, caulking, etc. Screen Cleaning – There is no point to hide clean windows behind dirty screens. For this reason, we provide this service to make the windows bright shining from both sides. Moss Removal – Since Seattle features a humid weather, it predisposes to moss formation and reproduction. Some moss spices are easy to remove, but others are much harder and can be removed without damaging the roof only by professionals. Knowing the challenges each type of moss offers, we have different approaches to their successful removal. Awning Washing – Awnings are used by the building owners as trademarks, but overtime their colors start to fade due to accumulated dirt. We offer revival of these awnings by thorough washing that will bring back their original colors and attractiveness. Gutter Cleaning – We make use of the latest equipment to clean gutters in your commercial building. Neglected gutters may lead to overflowing water, water siding inside the building and different water related damages. On the other hand, clogged gutters become a ground for pests and insects to thrive. That is why, it is recommended to take advantage of professional gutter cleaning at least once per year. Since they are critical for the overall look of cleanness but are located at hard to reach areas that are dangerous to clean, our professional and trained staff will safely perform this task with state-of-art cleaning equipment. We are ready to perform this service for all our Seattle and Bellevue clients. Pressure Washing – We use high-pressured water to remove all the mud, grime, dust, mould and loose paint from the surfaces of your building. It is a preferred method of washing not only because of its effectiveness, but also because it is a chemical free eco-friendly method to deep clean the windows, sheds, siding, and other surfaces. Soft Washing – Our company safely removes algae, organic stains, bacteria, and mildew from all softer building surfaces, including the roof. To perform this service, we apply low pressure that enables the cleaning agent to go deeper than the building surface and to penetrate into every pore and crevice for perfect cleaning results. 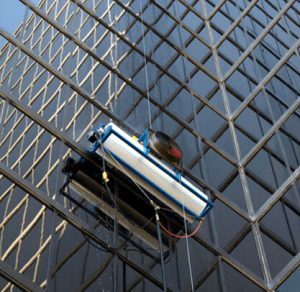 Skyscraper Window Cleaning provides eco-friendly, safe, and efficient window cleaning services in Seattle area that are great investment for enhancing the overall building’s appearance. The company provides affordable and reasonable prices that allow customers to save much money and enjoy superior cleaning results. We value every client and strive to build long-term relationships with them by satisfying their needs and requirements. Call now to book your cleaning!